The most common piranha -- the red-bellied piranha (Pygocentrus nattereri) -- is a freshwater fish found in South America’s rivers and streams. The highest concentration of piranha occurs in the Amazon River basin, northeastern Brazilian and the Guianas. These fish differentiate themselves from other aquatic species by being one of the most dangerous, aggressive fish species in the world. In terms of size, the piranha may not appear menacing. The average adult piranha measures 11 to 13 inches long and weighs around 8 pounds. Its body is predominately gray or silver with a reddish-orange underside. It may be a medium-sized species, but these fish pack a strong, ferocious bite for their size. 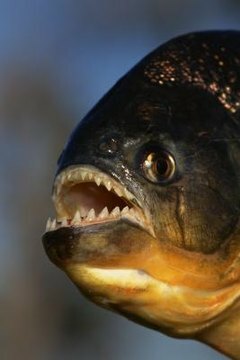 A piranha’s mouth is lined with a single row of razor-sharp, triangular teeth. They have a distinct under-bite, which means the bottom row of teeth is constantly exposed. This makes interaction dangerous and difficult; fisherman must handle piranhas with care if they want to avoid injury and keep all their fingers and toes. Some South American natives even use piranha teeth to make tools or weapons. Piranhas are opportunistic omnivores, not carnivores as they are commonly categorized. Though they seem to prefer eating other fish, a piranha’s diet includes carrion, insects, mollusks and even plants, fruit and seeds. Piranhas hunt in groups. A group of around 20 piranha hide in vegetation waiting for prey -- most commonly another school of fish. The piranha then attack the prey from ambush, ripping the fish into pieces or sometimes consuming them whole. During times of famine, piranhas are known to attack anything that enters the water, including small mammals and, very rarely, humans. Most piranhas are shy and non-aggressive, unless they are hunting or protecting their young. Adult piranhas generally hunt during the dawn, late afternoon and evening periods. It’s a good idea to avoid water with high piranha populations, especially during periods of low water and meager food sources. Another period of aggression occurs during reproduction. Spawning female piranhas produce around 5,000 eggs every two weeks. The eggs are housed in bowl-shaped nests at the bottom of rivers and streams. During this time, male piranhas fiercely guard the egg clutches, attacking any moving being that comes too close.